Notes: Charlie Craven introduced his JuJu style of patterns in 2005. Basically, it was utilizing two colors of Superhair for a ribbed body. Using a White thread as an underbody enhanced the coloration of the Superhair. A UV Clear Fly Finish is applied to the body to give the pattern a look of transparency. Charlie prefers to use Fluoro Fiber as a wing case and legs since the material produces less flash that might distract the focus on the body. 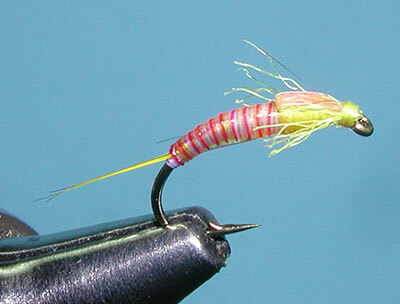 Charlie first used this pattern style on midges and, later, added tailing materials and an extended thorax, to imitate baetis. The JuJu Sally adapts to this style with a fine tail of some yellow grizzly saddle fibers that are divided and a thicker, tapered body using two strands of yellow Superhair and one strand of red Superhair for the ribbing. The thorax is extended to almost the midpoint of the shank. The Fluoro Fibers provide texture to the pattern and imitates both a wingcase and legs. As a side-note, Charlie's chose the term JuJu as it came from a nickname that he and his wife gave their daughter, JuJubee.